Cyprus has all the accommodation types. Most hotels and guesthouses are open all year. There are luxury hotels, family residences, apartments, villas, campsites, stylishly restored village houses, agrotourism accommodation, too many to mention. During the tourist season, most beaches have lifeguards. The zones where you can swim are marked with colored buoys. It is not forbidden to swim outside, but of course not recommended. Beach amenities as showers are standard everywhere. There are many stone or rocky beaches on the south coast. Cyprus is a great year-round destination. In winter it can still be up to 24 degrees and it is generally nice weather. Of course Cyprus is a wonderful beach destination in the summer, where there is also plenty to do for the more active holidaymaker. For Cyprus you need a passport that is valid for at least 90 days on arrival, you can stay for 3 months. No visa is required for Cyprus. You can buy duty free: 200 cigarettes, 1 liter liquor and 2 liters of wine. Nicosia is the capital of both parts of Cyprus and is located in the centre of the island. Nicosia is also the financial center. The capital is surrounded by Venetian city walls. Both parts of Cyprus are family-friendly. Risks for children are sunburn, jellyfish and stinging insects. Cyprus has a Mediterranean climate, tempered by the sea breeze. The sun shines more than 300 days a year. Few buildings in Cyprus have wheelchair ramps. Sidewalks are often uneven. A leaflet with information about disabled facilities is available at the CTO. Only a few museums in Cyprus have braille or audio guides. There is a big difference in prosperity between the North and the South. Partly because of the open economy, the level of prosperity in the Greek part is higher than in the Turkish part. The Cypriotic economy is particularly prosperous due to tourism, real estate and the export of agricultural products. Cyprus has a compulsory education for children aged between 4 and 15 years. In terms of construction, the actual education starts with the kindergarten. The last year of this falls under the compulsory education phase. This is a continuation in primary school for 6 to 12 year olds (classes 1 to 6) and the gymnasium for 13 to 15 year olds (group A, B and C). Through a final exam organized by the gymnasia, pupils complete their compulsory education with a diploma that provides direct access to general educational lycea or technical vocational schools for 15 to 18 year olds. Higher education institutions are at HBO and university level and there are public and private variants. The voltage in Cyprus is 220/240 Volts. There are English three-pin plugs. Most hotel receptions have an adapter for you to borrow. There are also hotels that have adapted the sockets to the current European plugs. Visiting religious buildings, appropriate clothing is required. Here you wear long pants or a skirt and make sure your shoulders are covered. Before you'll enter a mosque, you should take off your shoes. In the forests of Cyprus there is the Mouflon, this is a mountain sheep. Donkeys live on the Karpasia peninsula. On sandy beaches, flora turtles lay their eggs. Lizards, especially the sand lizard, you encounter everywhere. Pink flamingos and pelicans live along the salt lakes near Larnaca. The high mountains in Cyprus are covered with pine and cedar forest. In the spring, colorful flowers cover the hills and meadows. Cyprus has a long history of more than 10,000 years. Cyprus has been influenced by the Hellenes, Romans, Byzantines, Venetians, Ottomans and Britons. Cyprus is famous as the birthplace of Aphrodite. Every place in Cyprus has its own character. You can go out perfectly, enjoy a sun holiday, culture and nature. There is really something for everyone on this island and it is a great travel destination in both summer and winter. Cyprus is located in the eastern part of the Mediterranean, between Turkey and the Syrian coast. Turkey is at a distance of 75 km. The mountain Pentadaktylos extends over the north of the island. In the middle lies the overwhelming Troodos Mountains. The peninsulas Akamas and Karpasia are very rough. Cyprus, the island of Aphrodite, is of course ideal for a wedding trip and marriage is also possible. Cyprus is even one of the world's most popular wedding destinations. There are various possibilities for a wedding in Cyprus. All places have a municipal office where you can obtain the Marriage License. If you prefer to make a religious marriage, you should first go to the municipal office, otherwise your marriage will not be lawful. If you have arranged the administrative matters, you can make further plans for the wedding party. The island has everything you need for wedding dresses, wedding rings, flowers, cakes and so on. Some hotels have their own wedding chapel. There are also various wedding planners that can help you. One thing is certain, it will be an unforgettable wedding. You do not need vaccinations for Cyprus. You can drink the tap water safely. Healthcare in Cyprus is good, but expensive, insurance is absolutely necessary. Victims of accidents and emergencies are treated free of charge. Cyprus has 1,221,549 (2017) inhabitants. Cypriot society consists of two completely separate cultures; the island has a Greek and a Turkish part. In the south people speak Greek and in the north Turkish. In addition, they often speak English and German. The Republic of Cyprus has introduced the euro on 1 January. The currency in Northern Cyprus is the Turkish Lira. You can also pay with euros in Northern Cyprus. ATMs can be found everywhere. Credit cards are accepted in many places. In the north, the banking network is less extensive than in the south. You may enter an unlimited amount of banknotes on arrival, but you must indicate this. Photographing military bases or facilities and the border between the north and the south is absolutely forbidden. You can generally photograph for free archaeological sites. The state museums ask an amount for permission to photograph. In religious buildings it is best to ask permission in advance to be able to take photographs, usually flash is prohibited. Most Greek Cypriots are Cypriot Orthodox. The Saints Barnabas and Paul would have spread Christianity in Cyprus. Islam is the largest religion in the north. Cyprus has a low crime rate. Always pay attention to your belongings, especially in busy places. There are frequent forest fires in Cyprus. There are two types of fire service in Cyprus, one for general emergencies and one for forest fires. Always make sure that you do not cause forest fires caused by cigarettes. Ambulance: 112, forest fire brigade 1407 (north: 177), fire brigade: 112 (north: 199), police: 112 (north: 155). Smoking in hotels, restaurants, bars, airports and other public buildings is prohibited. Even if there are special smoking areas. Note: in Cyprus, both the entrepreneur and the smoker can be fined. It is forbidden to smoke in a car or camper in the presence of someone who is younger than 16 years. The country code of Cyprus is +357. The quality of telecommunications is very good in Cyprus. Calling the police, ambulance and fire department is free. Cyprus is located in the Eastern European time zone. It is one hour later than Central European time. In the period from the end of March to the end of September one has summer time in Cyprus. The Troodos Mountains are a volcanic massif. It lies almost 2000 meters above sea level. The Pedieos, the longest river in Cyprus, rises in the Troodos Mountains. 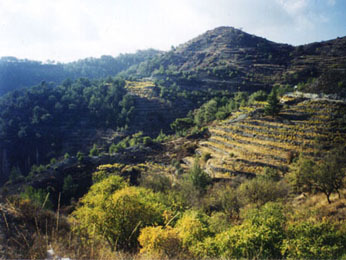 Numerous vineyards extend on the southern slopes. The highest mountain of the Troodos Mountains is the Olympus, which is 1952 meters high. You will find mountain streams and beautiful waterfalls between the mountains. In winter there is regular snow in the Troodos Mountains and you can ski on a limited scale. They are driving on the left-hand side in Cyprus. The roads in Cyprus are in good condition, even in the mountains. Cypriot drivers sometimes ignore zebra crossings. There are heavy fines on driving without a seatbelt or the use of a cell phone when driving a vehicle.